If you have an adventurous spirit, then Cape Romain is the place for you. It’s not that there is a lot to see once you arrive but the quest of getting there is the challenge especially if you don’t know the area well. When I was getting together a list of the lighthouses to visit when starting my Carolina and Georgia lighthouse book, the Cape Romain lighthouse didn’t show up in most of the lighthouse books that I owned. I had heard it mentioned but it really slipped my mind until we passed a sign on our way down Route 17 from Georgetown to Charleston. It read Cape Romain Marine Sales and had a small lighthouse pictured on one side. I drove a few miles, not thinking much about it until a light went on in my head. We turned around and pulled into the gravel enclosure where I had first noticed the sign where there a variety of fiberglass boats on display. Inside the office I inquired if there was a lighthouse nearby. After learning there was, they gave me a small map to help us find our way. 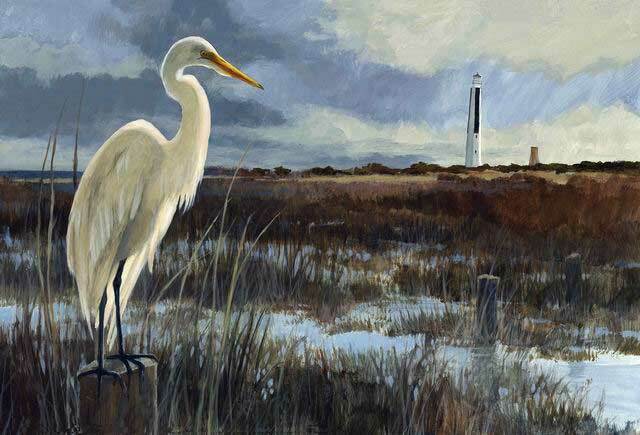 We drove down a side road a few miles and launched our small boat with map in hand of the marshes and the Cape Romain lighthouse but as soon as we had left the dock we were lost, not once or twice but from then on. We found ourselves in a devious never ending maze of marshes made from saw grass just high enough not to be able to see over. They all looked exactly alike and separated by narrow waterways. It was like some sort of devious maze straight out of the Sunday newspaper from the entertainment section, only these were full size and we were the ones that had to find the exit. In addition, the lighthouse was so far away from where our starting point it was not even visible. After some effort and travel we spotted what we thought was the lighthouse and slowly motored our way toward the tower. Eventually it became clear that we were heading in the right direction. The map, that we were so happy to have received actually became useless almost from the start because once I took that first wrong turn it becomes totally meaningless. I didn’t see one marker during the whole trip to tell us where we might have been. After finally arriving at the Cape Romain lighthouses we found what was years ago a dock with only a dozen or so short pilings remaining and they were camouflaged by marsh grasses buried in a bottom of deep soft muck. I carried Sarah ashore and cautiously followed what was barely a path through the towering weeds and underbrush shaking a stick ahead of me as we went. If I was going to startle some unsuspecting rattlesnake I didn’t want to do it by stepping on it especially so far from the mainland and knowing the way back would be as difficult as getting there. At the foot of the Cape Romain lighthouse we heard noises nearby and then it was evident who made the path…wild goats. Lots of goats. This was the most desolate place I have been in many, many years. I truly got a feeling of how desolate it must have been to tend a lighthouse at a place like this. If our outboard motor hadn’t started I think we might has still been out there and that crossed my mind as we were looking around the light. The two lights are close together, maybe five hundred feet apart. The older light built in 1827 stood only sixty-five feet high and was meant to guide vessels past the dangerous shoals and help southbound vessels from getting too far out into the Gulf Stream which would slow down their progress. Thirty-one years later in 1858 a hundred and fifty foot octagonal lighthouse replaced the first one. The top of the lighthouse or the lantern room as it is called, was taken from the old light and used on the new one leaving the red brick tower bare. Within eleven years after the new tower was built, problems with cracking began to appear and a few years after that the lighthouse was leaning almost twenty-eight inches off center making it necessary to adjust and level the lens several times during that period until the settling stopped in 1891. The light burned bright for 89 years but was finally extinguished by the Coast Guard and reduced to a daymark at that time. We made our way back to the mainland, again loosing our way several times but the adventure was certainly worth the effort.